Our Test environment has two servers without a domain that mean we will use a basic Workgroup setup for this HowTo (if the two servers will be part of the domain a replica with SSL setup you could leave out Step 5). 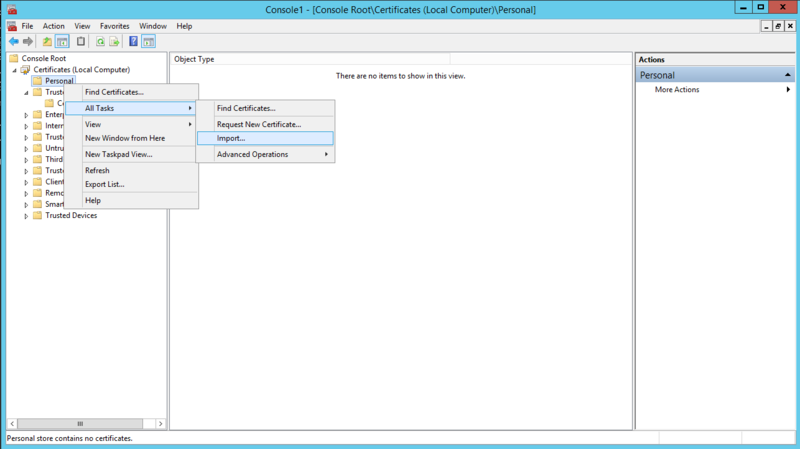 In the first step we will create a root certificate that both servers can use. Run the following command on our primary Host VMH01 to create a self-signed root certificate. makecert -pe -n "cn=TestHyperVRootCA" -ss root -sr localmachine -sky signature -r "TestHyperVRootCA.cer"
The command will install in the certificate into the root store of the local machine and saves the file locally. 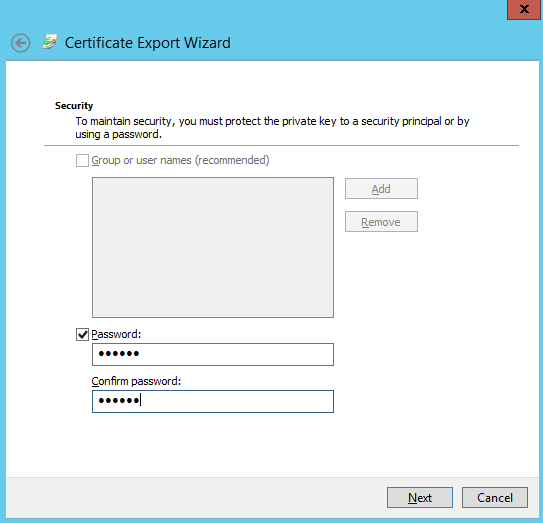 Now we will create our Hyper-V Hosts (VMH01, VHM02) certificates and signing them with our previously created root certificate. 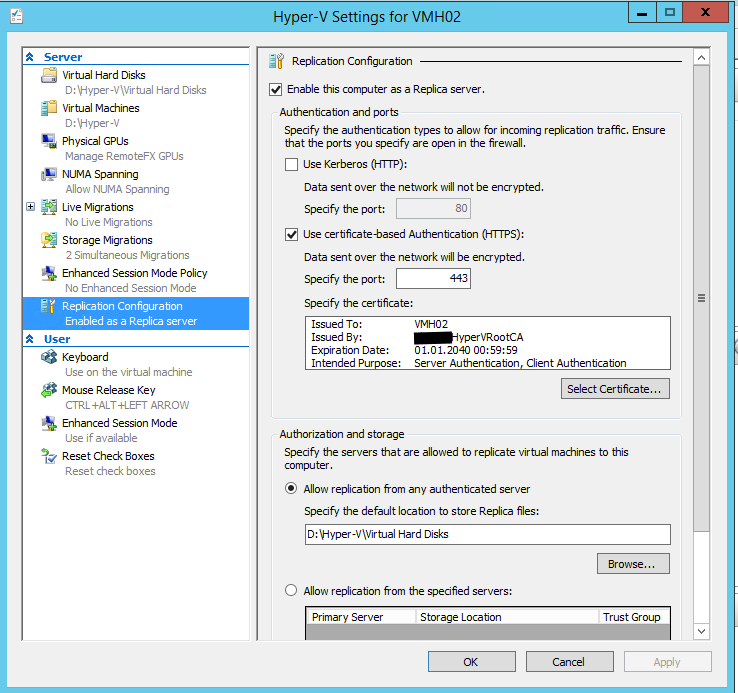 Please Replace with FQDN of Hyper-V Hosts machines e.g. VMH01, VMH02. 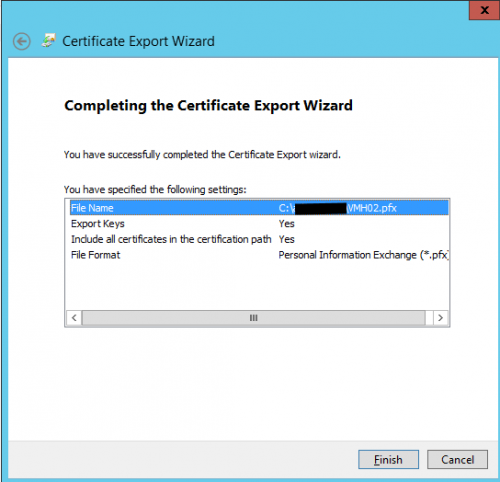 The previously executed commands will install two certificates into the Personal store of the local machine and saves the file locally. 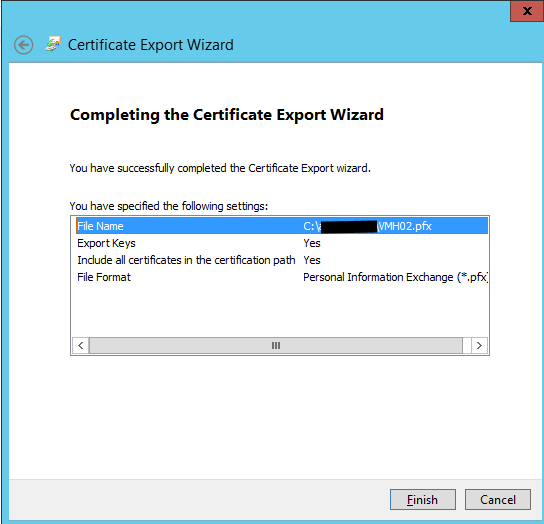 The created certificates can be used for both Client & Server authentications. 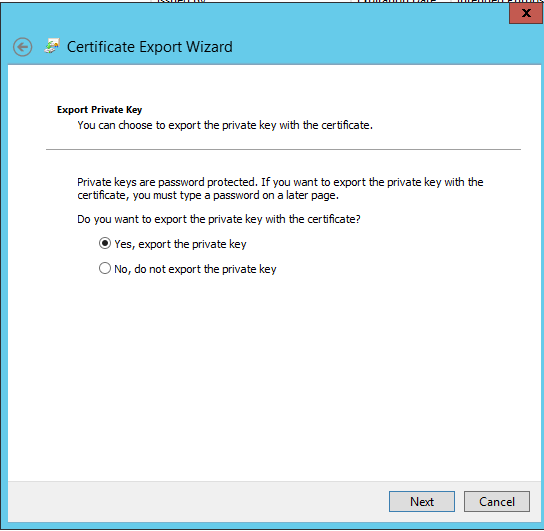 Open the mmc certificate Snap-In (Local Computer) on our primary Host VMH01 and export the certificate (with Private Key) that has been generated for VMH02 (see screens below). Copy TestHyperVRootCA.cer and the above exported certificate (VMH02.pfx) to our secondary Host VMH02. 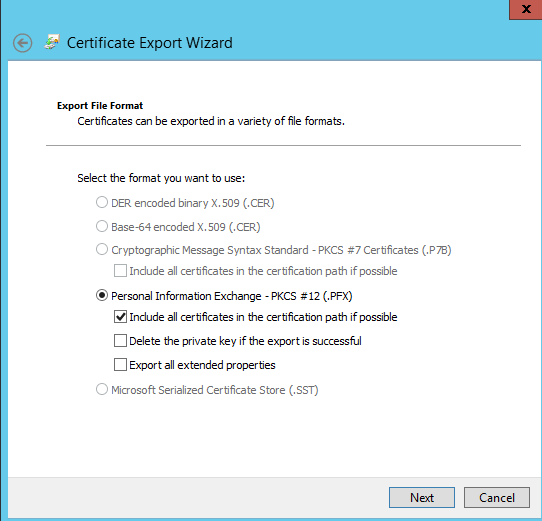 certutil -addstore -f Root "TestHyperVRootCA.cer"
Open the mmc certificate Snap-In (Local Computer) on our secondary Host VMH02 and import the certificate (VMH02.pfx) in the Personal store of the server (see screen below). 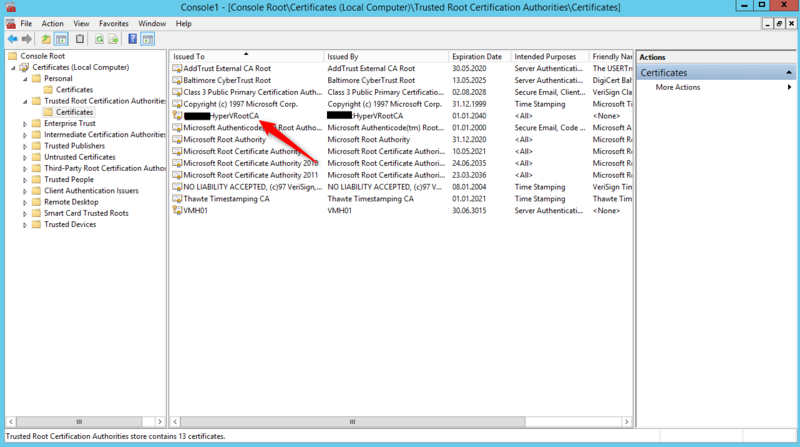 Please note by default a certificate revocation check is mandatory and self-signed certificates don’t support revocation checks on Windows Server 2012. 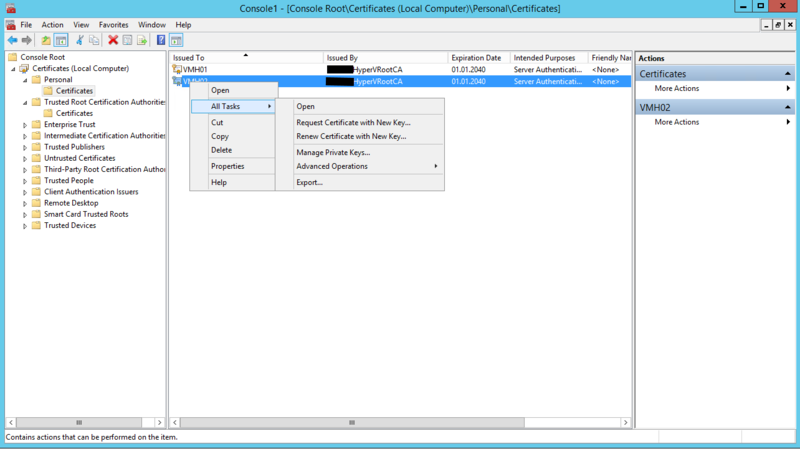 Set the Value for DisableCertRevocationCheck to 1 (disabled). Keep in mind that maybe a reboot of the System is required! To ensure that our servers find each other in a non-domains setup, we need to make some small changes hosts file of the respective hosts. 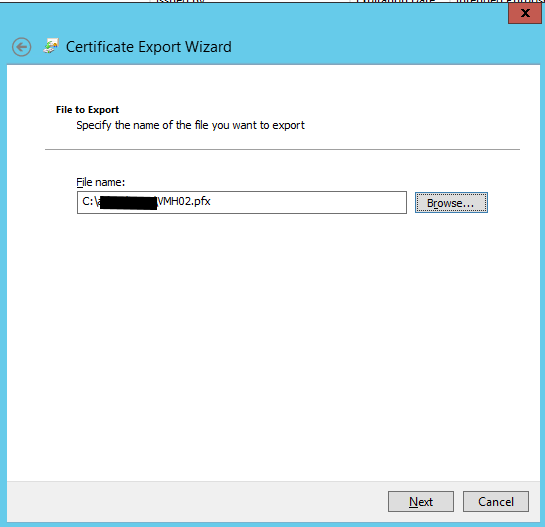 This will be necessary cause Replica only work with FQDN entries. To ensure that our servers could find each other in a non-domain setup, we need to make some small modifications on the server’s hosts because replica will only work with FQDN entries.